HONOLULU (Reuters) - A series of summit explosions on Saturday from Hawaii's Kilauea Volcano spewed ash up to 11,000 feet (3,353 m) and dusted the grey powdered rock on communities to the southwest, the Hawaiian Volcano Observatory said. 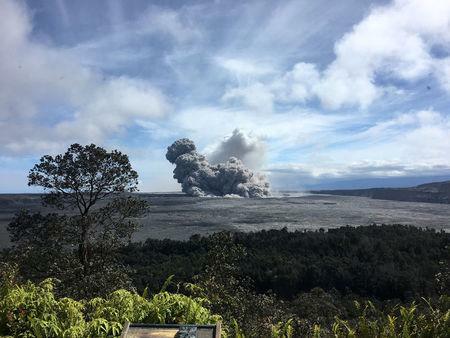 The three explosions, which began around 12:42 a.m. (6:42 a.m. ET/1042 GMT)), marked the latest bursts of ash and volcanic smog from Kilauea during the fourth week of what geologists rank as one of its biggest eruption cycles in a century. Some 25 miles (40 km) down Kilauea's east flank, lava gushed from six giant cracks, with molten rock from two fissures advancing over another street of homes in the Leilani Estates housing development, the observatory said in a statement. The number of houses and other structures destroyed by lava flows in the island's lower Puna district leapt to 82 on Friday from a previous count of 50 after fissures reactivated in Leilani Estates this week. 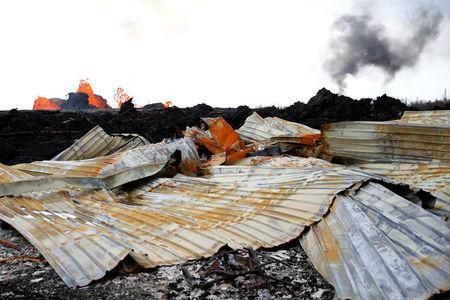 Another lava flow near the rural housing development slowed and was 150 yards (137 m) from Pohoiki Road, where there are dozens more homes, the observatory said. 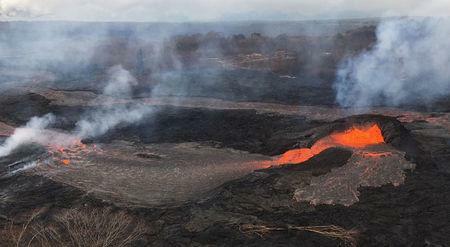 Around 2,000 residents of Leilani Estates and nearby Lanipuna Gardens remain under evacuation orders due to lava flows and high levels of toxic sulfur dioxide gas from volcanic vents.